Eclipse of the Snow Moon over Westborough, February 20, 2008. The totally eclipsed moon looks red-orange. Wednesday night during school vacation week, Feb. 20, was perfect for watching an eclipse – clear and crisp, with a full moon shining brightly. The earth’s shadow crept across the moon’s face, slowly blocking the moonlight until the moon looked red-orange. Eventually the shadow receded, steadily revealing the bright moon again. The next total lunar eclipse that we can see in the northeastern U.S. won’t take place until Dec. 21, 2010, two and half years from now. 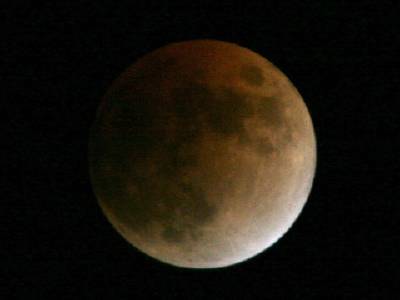 These days a lunar eclipse captures our attention and reminds us of the moon that we barely notice in our busy lives. But in days of old, when most people lived closer to nature, observing the moon was a routine part of life. Early Native Americans had different names for the full moon throughout the year, and the colonists borrowed or adapted some of them. These names reveal a connection with events in the natural world. Most of us have heard of the Harvest Moon – usually in September – and perhaps the Hunter’s Moon or Blood Moon in October or November. But how many of us know that it was the Snow Moon that was eclipsed last week? A snowstorm bore down on us two days later, as if to make us remember that name in the future. Do we know that we, like the returning robins, can look forward to a full Worm Moon in March? This moon heralds thawing soil and the renewed activity of earthworms. The full moon in March has a variety of names that reflect the coming of spring in different environments: the Sap Moon, noting the time for tapping sugar maples to make maple syrup; and the Crow Moon, recognizing the noisy return of crows to northern parts of New England. Another name, the Crust Moon, describes the way the snow crusts over at this time of year, due to melting during the day and refreezing at night. January: Wolf Moon, from the howling of hungry wolves in the winter landscape; Hunger Moon, for the deprivation that the depth of winter can bring to humans and wild animals alike. February: Snow Moon, for the heavy snows typical of this month. March: Worm Moon; Sap Moon; Crow Moon; Crust Moon, for spring events noted above. April: Pink Moon, after the moss-pink or moss-phlox (Phlox subulata) that grew abundantly in some areas; Egg Moon; Sprouting Grass Moon; Fish Moon, for the shad (Alossa sapidissima) that were caught for food as they swam upstream to spawn at this time. May: Flower Moon; Corn Planting Moon; Milk Moon. June: Strawberry Moon; Hot Moon. July: Buck Moon, for the time of year when male deer start to grow their antlers; Thunder Moon; Hay Moon. August: Sturgeon Moon, for the sturgeon (Acipenser) that were easy to catch in the Great Lakes and Lake Champlain at this time of year; Red Moon, for the reddish look of the moon rising on hazy evenings; Green Corn Moon; Grain Moon. September: Harvest Moon; and in certain years, Corn Moon. Why the different names in different years? The full moon closest to the fall equinox is always named the Harvest Moon, but when the Harvest Moon falls in early October (as it did in 2006), September’s full moon is called the Corn Moon. Another name for September’s moon is the Barley Moon. October: Hunter’s Moon, for the hunting that begins after the harvest; Travel Moon; Dying Grass Moon. Note that in one year out of three, the Harvest Moon occurs in early October. November: Beaver Moon, for the beaver activity at this time or year, or for the season for trapping beaver for fur; Frost Moon, for the frosts that are common now. December: Cold Moon, for the arrival of cold weather; Long Nights Moon, for the longest nights of the year. But what about the Blue Moon? You’ve probably heard the expression “once in a blue moon,” referring to something that doesn’t happen very often. Two definitions exist. In one, a blue moon is the second full moon in a calendar month that has two full moons – which happens once in every 33 full moons, or every 2.7 years. The last blue moon came in May 2007, and we’ll have the next in December 2009. In the other definition, a blue moon is the third moon in a season (spring, summer, fall, or winter) that contains four full moons instead of the usual three. Rarely, one month – February – has no full moon at all, and in the same year both January and March have blue moons. This happens because full moons occur every 29-1/2 days, and February is only 28 days long, except in leap years (such as this year) when it has 29 days. The last year to have a February without a full moon was 1999. The next Februaries without a full moon will come in 2018, 2037, 2067, and 2094. In any case, early Native Americans weren’t the only people to name the moons. Cultures across the globe have done so, and most of us don’t even know it. But the recent eclipse of the Snow Moon can remind us of the natural world around us and of our historic connections to nature. Have some fun with moon names. Write them on your calendar, ask your kids why they think the moon got those names, and look forward to the month-by-month changes we can see in nature.